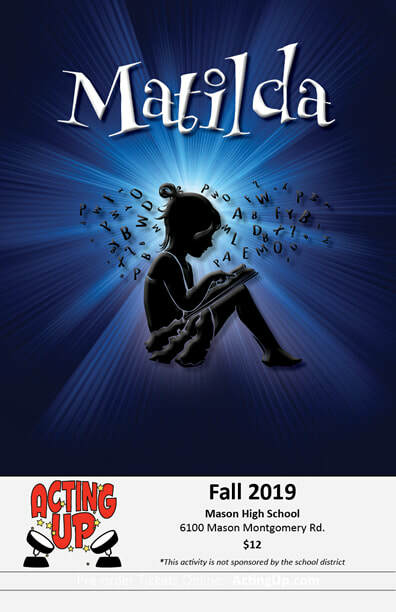 The cast list for our 2019 FUNraiser has been posted. Auditioners, please review and note the important steps to take to confirm acceptance of your role. It's time again for our annual Senior Spotlight Dinner Celebration! Join us as we honor our graduating seniors and announce our Spotlight Scholarship winner. Anyone who has ever been in an Acting Up production (on stage or backstage), and their families, are invited. Reservations are $10/person and include dinner and dessert. The event will be Sun. May 5, 6-9pm at the Mason Municipal Center. ​Reservations are required. Please fill out and return (with payment) before April 23, this Reservation Form. ​Just cast in a new production, and now trying to figure out how you'll possibly learn all those lines in time? Never fear, we have some tips to make this process just a bit easier, and your acting better for it. Click here for more info. And yes, there is an app for that! This is an excellent book for both those new to acting as well as advanced actors. It is a relatively short read, full of succinct and simply set forth principles and activities. Experimenting with these principles will enable you to give a better performance. An Actor's Companion, Tools for the Working Actor. ​Acting Up was established in 2005. We have produced over 20 musicals since then, with casts of 80-120 young performers ages 6-18. Below are just a few highlights from those musicals. Please visit our About Us page for more information on our mission and goals. Thanks for voting Acting Up the "Most Loved Acting Studio" for 2018! ​We always like to know what other area productions our Acting Up alumni may be involved in. If you have been a member of any Acting Up production, and are currently in another production, drop us a note (Webmaster@ActingUp.com; with the subject "WATN? Update")with the details and we'll post it on our Where Are They Now? (WATN?) page. Who knows, you may see several familiar faces in the audience!